Maybe you were snapping a shot of your kid in low light. Perhaps you were using your phone to take notes from a whiteboard. You clicked the shutter and discovered: oh no, the picture turned out blurry. Time to trash it? No. If you were on CSI, you'd just tell the nerdy computer guy: "Enhance!" Here in the real world, your not-so-nerdy self can do the same magic: "Blurity!" This video shows Blurity being used to deblur a blurry photo of a hockey goalie. It's easy to fix the blurry picture using just a few clicks. Notice how much detail is recovered in the deblurred photo. Blurity enhances the photo, making it go from unusuable to great. With Blurity, you too can unblur pictures. Blurity removes motion and focus blurs, such as when your camera moves while taking pictures or when the autofocus misbehaves. Using millitary-grade "blind deconvolution" technology, Blurity makes impossibly blurry photos clear and text legible. Amazing! Installation is quick and easy, and no extra tools are required. Simple to use, with powerful options available. Install it, launch it, deblur it! Blurity is great software, your customer service even better! I am working a huge case involving civilian casualties and a military aircraft. 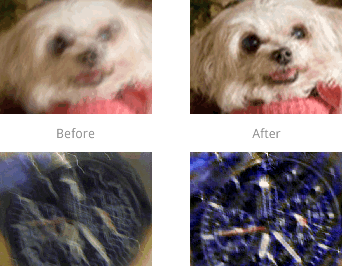 Blurity is providing an extra edge of clarity to seemingly unsalvageable cell phone images. Once again your product has helped recover details that could not be achieved otherwise. Make your motion-blurred fuzzy photos sharp and crystal clear. More powerful than Smart Sharpen. Far better than Unsharp Mask. A tool for forensic analysis of grainy, blurry, illegibile photos. Powerful software for Windows and Mac OS X that can fix blurry pictures. Blur is bad. Sharp is good. Blurity. Enhance your pictures. Reveal hidden detail.